Diet modifications and following an exercise regimen are not the only two things that help you lose weight. If you do not see yourself winning the battle with stubborn fat, you may consider trying barley water. Barley, a fibre-rich grain, is served as a rice substitute. When it comes to losing weight, Barley falls in the same category as whole wheat, oats and whole grains. Calorie Count: Barley water is prepared from raw barley (a cup of serving size of 200 grams). It contains 600 to 750 calories approximately. These calories have to be burnt in about 200 minutes of brisk walking. It is one of the effective weight loss remedies as very little of these calories come from fat. Most of the calorie content is contributed by complex carbohydrates. Therefore, it is inevitable for barley water to be quite an effective remedy for weight loss. Fibre: Barley contains a lot of fibre, which helps one feel full for a long time. When you keep a check on your cravings, you have a better chance of losing weight. Instead of snacks that are loaded with calories, have barley water to feel fuller and healthier. Smooth Bowel Movements: Besides fibre and low-calorie count, barley water makes sure you get a proper bowel movement. Fibre helps cleanse your digestive system and detoxify your body. 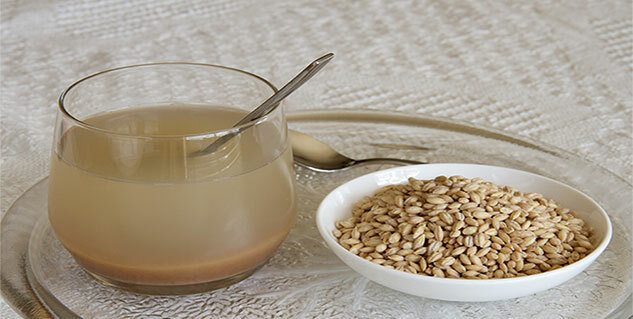 To prepare barley water, you need 1 cup full of organic barley, 4 cups full of water and a spoon of lemon. Put these ingredients in a pan and rinse for 10-15 minutes. Heat the pan, bring the water to a boiling state and simmer for 20-25 minutes with the lid off. It will reduce the volume of water by about one-third. Now, let it cool. The grains will be softened and cooked by now. Pour the barley water mixture through a sieve. Barley water is best served cold. Drink up to 4 cups full of barley water daily to reap its health benefits, including weight loss.